How to choose the right hair straightener? In order to understand which straightener is better to choose let us gain an insight into its working principle. 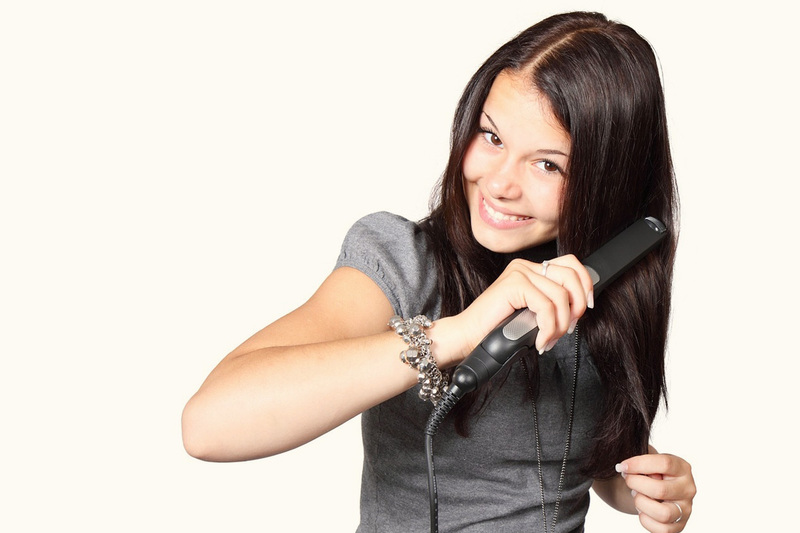 A straightener (or a flat iron) reduces the moisture surplus in hair. Under the hair cuticle layer there is a cortex section, which contains hydrogen bonds responsible for hair ripple and their ability to curl. These compounds become more active in wet weather, which facilitates more evident hair curling in rain or snow. In this case the main role of a straightener is to reduce the moisture surplus in cortex layer by heating, reducing curliness thereby. It is commonly known that continuous exposure to heat causes changes in hair structure, they become brittle and more subject to mechanical influence. Therefore the criterion of plate material for choosing a straightener is of primarily importance and it is definitely not worth saving on it. The safety level of an appliance most often depends on the type of plate material. Nowadays there are a number of plate types existing, such as metal, ceramic, tourmaline and teflon. Straighteners with metal plates are available at low costs, which can be a determining factor of choice in many cases. However, metal plating is one of the most harmful for hair structure. Metal plates don’t become hot evenly and create hot spots which can burn hair, damage their structure and cause split ends. The most widespread plating is ceramic. It heats homogeneously and keeps optimal temperature, providing smooth glide of the plates and resulting in hair not only resistant to fragility, but also preserving shine and elasticity. The disadvantage of ceramic plating lies in the fact that different hair cosmetic products used right before the hair styling can stick to such plates. In order to minimize this negative effect plates should be wiped with a moist cloth every time after straightening. More advanced materials, such as tourmaline and teflon, have a number of benefits. Tourmaline, for example, releases negatively charged ions when heated, which helps to reduce static. Teflon prevents sticking of hair styling products to plates and therefore prevents scorching. On top of that, the additional option of titanium or diamond coating provides a smoother glide of a panel, as well as gives an extra shine. Such a feature as ionization is one more step towards hair recovery during the styling process. This function is very useful for hair beauty and health preservation. Unfortunately, not all the straighteners are provided with it. The core gist of ionization function lies in the fact that straightener plates are covered with a special ion layer (tourmaline, for example) which releases a flow of negatively charged ions when heated. These ions envelop each hair and restore their water balance. Ionization feature helps us keep our hair healthy, supple and shinier. Static is also reduced due to ionization. Depending on the structure, type and condition of hair it is recommended to choose a definite temperature mode for straightening. Plates can reach temperature comprised between 140 – 230 degrees, but one and the same temperature may not be suited for different hair types. If your hair is thick, limp and brittle, choose the minimal temperature mode, this way you won’t do any great harm for them. The owners of healthy, tough and wavy hair can (and in case of curly hair sometimes even have to) choose the maximal heating temperature. Straightener plates can be narrow (with the width of up to 2,5 cm) and wide (with the width of more than 2,5 cm). Narrow plates are suitable for small thin locks of hair and bang. They are easier in use, but because of the narrow work surface it is difficult to straighten big locks of hair with them. It is quite inconvenient, as you have to split a lock into a bigger number of parts, which adds significantly to the styling time. Nevertheless, there is an important advantage of narrow plates: you can use them as a curler. To do so plates should have rounded edges and the top part should have a special cover. While choosing the flat iron, as well as any other household appliance, it is necessary to follow the long-standing criteria for choosing small personal appliances. You can trust well-known brands and spend freely on such straighteners. World-famous companies specializing in household appliances usually follow all the novelties of technology. Therefore you will be able to purchase an iron containing all the above mentioned functions. There are a number of companies specializing in hair tools and appliances exclusively. The majority of hairdressing salons and beauty studios prefer them in particular. When designing their product such manufacturers take all the necessary aspects into account, such as purpose, safety, efficiency, harm minimizing and optimization of the straightening and styling processes. The price of flat irons by such manufacturers is above average. However it does not provide a guarantee that a professional appliance will be much better than other products offered by average household appliances manufacturers.